You’re busy. That lunch meeting (or other meeting) that sounded good a month ago when you agreed to meet … well there just is not enough time. You need to reschedule, or cancel the lunch or other meeting. It’s easy to just decline the meeting. Press the decline button … done. But what is the impact? 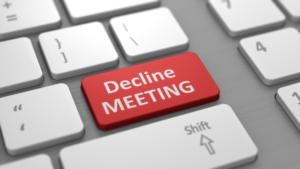 Baseline is that a rejection of a meeting without any comment feels disrespectful at best. It is often seen as rude. It is one of the “mundane moments” that breaks down trust. When that mundane moment is handled well, it can build trust. A few words of apology and interest in rescheduling makes an enormous difference in how it feels to the other person. I have seen people make major judgements about a person that cancelled without comments. Were the judgements justified? Probably not. One of the largest human fears is rejection. We are not normally conscious of the strong tie. It comes out in less obvious ways. A gracious decline can reduce or even eliminate the rejection emotion if the message affirms the desire to meet at a future time. “But, it was my assistant who sent the decline, not me!” That’s even worse. Be sure your assistant is aware of the importance of being gracious. “But they are INSERT HERE [subordinate/ vendor/networker/job seeker] so I should be able to decline. I was doing them a favor.” Maybe so. The more power you have over the other person, the bigger impact rejection is likely to have on them. You may never know how they get back at you for your rejection, if you are not gracious. Being gracious is the right thing to do with another human being. It’s also wise for your career.